Women spend a lot of time, money and effort to look great and maintain a youthful appearance. Just look at the cosmetics counter either at the mall or in your own bathroom and you’ll see the myriad of serums, lotions, and creams that boast anti-aging for the face, neck and even the chest. With time and age, the skin on the back of the hands loses collagen and elastin, becoming thinner and less plump. The skin is so thin that it’s just draping over bones and showing the other anatomical structures found there; veins and tendons. With bones, veins and tendons more prominent, hands can appear much older than you look or feel otherwise. The first step in rejuvenating your hands is to create volume and collagen. This is the best way to to hide those visible tendons and veins. To achieve a fuller looking hand, we use dermal fillers such as Radiesse or Juvederm Volume XC. These fillers are injected into the hands to create a layered effect between the hand anatomy and your skin. Dr. Atkin will evaluate your hand and select the filler that is best suited for your individual needs. The procedure is relatively painless, quick, free of downtime and can last up to one year. The next step is to treat any brown spots, sometimes called liver or age spots. Before or after plumping up the back of the hands, we use the IPL Photofacial to reduce the brown and red spots that are causing your hands to look aged. You may experience darkening of the spots initially and after a normal recovery process within 1-3 weeks, your hands will look brand new! Sun protection is essential in maintaining a youthful look to your hands. 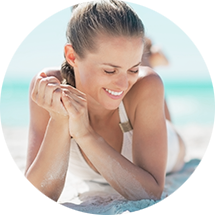 SkinMedica Environmental Defense SPF 50 should be applied daily and if you spend a good amount of time outdoors, you will want to be sure to reapply your sun protection every 1-2 hours throughout the day. Colorescience SPF 50 powder sunscreen is the perfect solution for this. It can be carried in a pocket or purse and brushed on to provide an instant physical barrier. Creams with natural bleaching elements, antioxidants and sun block are a great to maintain your youthful-looking hands. Our top pick options are: TNS Essential Serum with its’ unprecedented combination of growth factors and an antioxidant peptide serum. TNS Recovery Complex (the growth factor component of TNS Essential Serum) has been clinically proven to reduce the appearance of fine lines and wrinkles, diminish the appearance of age spots and sun damage. The potent mixture of antioxidants, peptides and other innovative anti-aging ingredients to strengthen the skin’s natural ability to regenerate itself, fight against environmental damage, plus smooth and tighten the skin. SkinMedica’s Lytera Brightening Complex is a natural way to lighten and brighten the skin. Its’ plant derived ingredients brighten and even out skin tone. The combination of fillers, lasers, and creams can keep your hands looking young and fresh for six months to one year or longer. 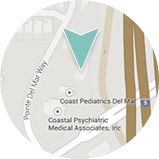 If you would like more information about hand rejuvenation in our office, or to schedule your treatment today, please contact Dermatology & Laser of Del Mar.